is my word of the day. I just took a look at a blog I used to read, there was a new post. It was o.k. (Sorry Tim). Anyway while I was there I fell down a rabbit hole of blog lists, you know pick one at random, rinse, repeat. I ended up in a place where the message was basically "Did you miss me? I'll be back". It was dated in 2013. My, how time flies, did you miss me? Anyway, here are a few random pictures with captions. You can tell I've lost heart with it all because I'm hosting them on Blogger instead of the paid for hosting. No, you're stupid. 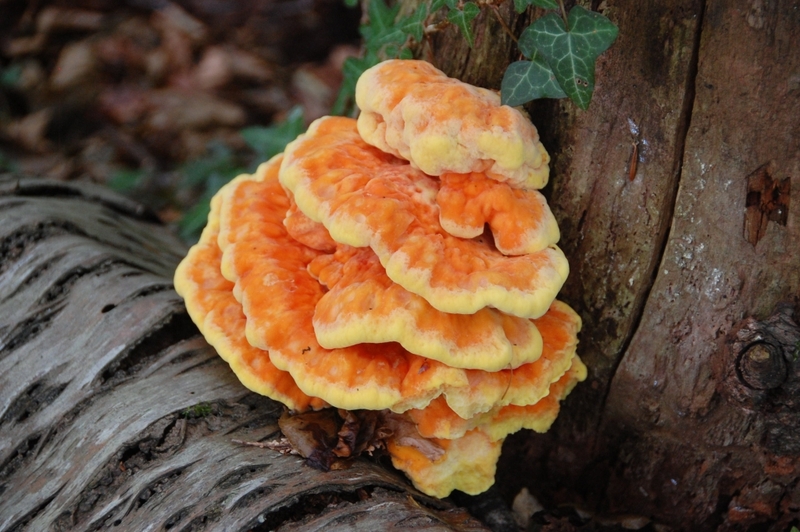 I was going to sort them into chronological order but honestly... anyway this is this year's chicken of the woods which has come back in the same place even though said place is almost sawdust now. If you're going to eat one, cook it well. The veg garden is doing o.k. apart from the onions. I don't know why. Actually I do, I abandoned the patch to look after the oca which needed me more and they were swamped in weeds. 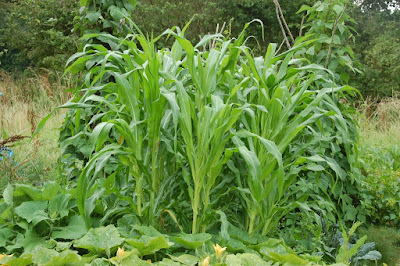 The corn this year is Stowell's Evergreen which I'm hoping will be nice. 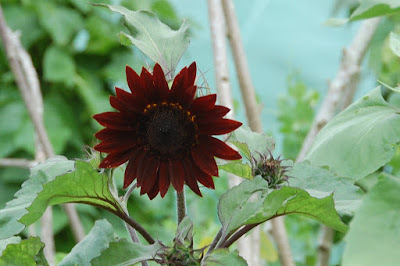 After the mice ate most of the sunflower seedlings I almost gave up completely. There are five plants left and this is the first and possibly the prettiest until the next one comes out. The waterlily stock tub is looking rather lovely this year. We swapped a red lily for a pinky cream one which is flowering beautifully. This frog has made his home here along with newts, beetles and pond skaters. Nature is amazing. 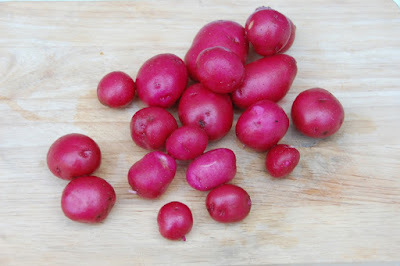 Potatoes - these are the very first red Duke of York - are doing pretty well this year. Bluebell are absolutely fine but we probably won't grow them again. Mayan Gold are delicious but impossible to cook. The Ambo are large and good. Still to come Arran Victory, Sarpo Mira and some Prunelle. No doubt the blight will be along shortly. Is the sun going down? Brexit has buggered up most things, my always tenuous grip on security is now dislodged again. Tune in again, there may be another episode later in the year. Thanks. I'm sorry to hear your mice are as horrid as mine. Do you have deer pests too? The deer are roundabout, I watch them with trepidation from my window - but luckily neither they nor the rabbits come into the garden (yet). 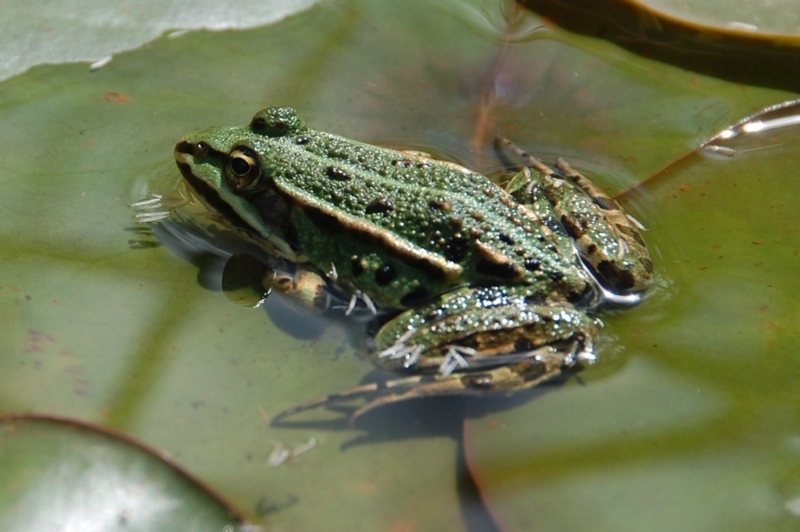 Thanks for posting on my blog. If you want seed of Hesperis I can pop some in an envelope and send you some - I think I could open a shop with all I have this year (and bronze fennel). Email me your address to my blog if you don't mind sharing it with some random internet stranger. Did you eat the Chicken of the Woods? I always think it should taste better than it actually does! We finally had rain here so hopefully there should be a flush of the Miller - I picked a couple of Hedgehog fungus yesterday.